"Tight end Mark Andrews #89 of the Baltimore Ravens leaps over defensive back Desmond King #20 of the Los Angeles Chargers in the fourth quarter during the AFC Wild Card Playoff game at M&T Bank Stadium on January 06, 2019 in Baltimore, Maryland." It's a New Year and that rings in the start of the NFL playoffs. Every snap and down has a much bigger meaning as teams fight for the right to hoist the Lombardi trophy. Stakes are higher and players are willing to sacrifice everything to play for a chance to win it all. 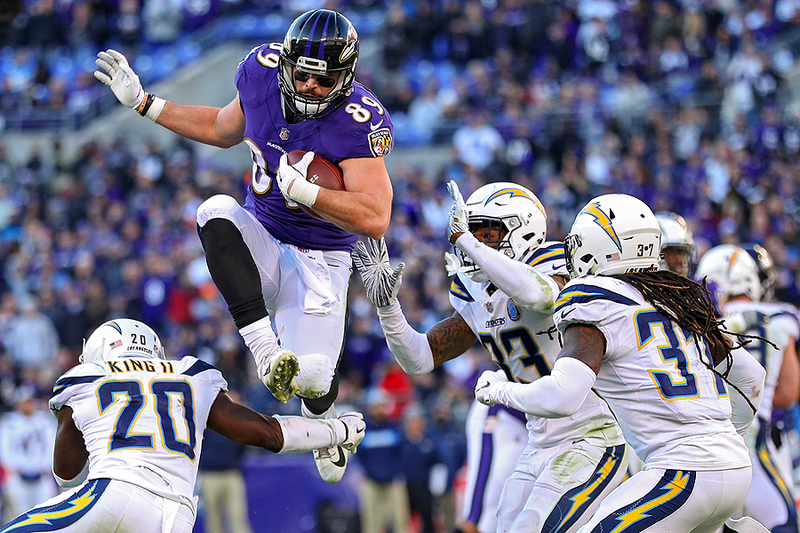 The Wild Card weekend started at home in Baltimore as the Ravens tried to claw their way back into contention - but ultimately fell to the Los Angeles Chargers. As always, it will be a fun ride to the Super Bowl - and will hopefully produce those iconic images that make football one of the most exciting sports to photograph.